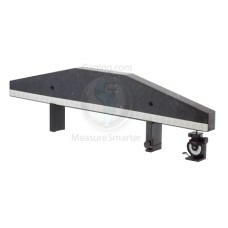 Planekators are used to measure flatness of Surface Plates or similar. Each kit includes a Grade AA Granite Straight Edge with correction tape, .000020” indicator, indicator carriage with carbide feet, one fixed support and one adjustable support, heavy duty case. When choosing a Planekator pick one that is equal to the width of the plate and at least 50% of the length. Starrett Tru-Stone (Rahn) Planekator Kit 24"
The Starrett Tru-Stone (Rahn) Planekator Kit 24" is on sale at Gaging.com Planekators are used to..
Starrett Tru-Stone (Rahn) Planekator Kit 36"
The Starrett Tru-Stone (Rahn) Planekator Kit 36" is on sale at Gaging.com Planekators are used to..
Starrett Tru-Stone (Rahn) Planekator Kit 48"
The Starrett Tru-Stone (Rahn) Planekator Kit 48" is on sale at Gaging.com Planekators are used to..